San Francisco has about 1,500 taxis, double its fleet of 15 years ago. The total gasoline used each year by those 1,500 taxis is about half the total used by the 750, in years past. San Francisco taxi operators are saving millions by with a fleet that is 92 percent hybrid or fueled with CNG. San Francisco taxis average a punishing 90,000 miles per year, driving day and night on smooth streets and potholes and killer hills. Under these conditions, gasoline for a traditional taxi costs over $20,000 per year. For a Prius taxi, under $7,000. Even if a taxi operator spent an extra $2,500 every other year for a new hybrid battery pack, they save a fortune. San Francisco taxis have reduced gas use by 2.9 million gallons per year and lowered greenhouse gas emissions by 35,000 tons annually. California Lt. Gov. 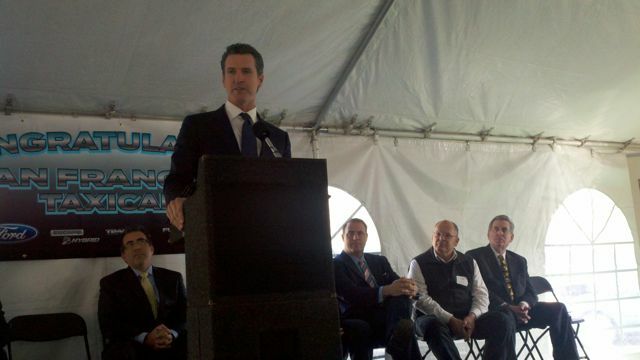 Gavin Newsom joined the celebration yesterday in having the nation’s greenest taxi fleet. Back in 1997, as one of the city’s Commissioners he was asked to chair a task force to help taxi operators and drivers. 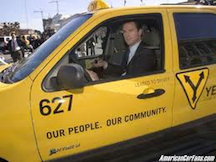 Newsom recognized the potential for cleaner taxis, since he personally was driving the General Motors EV1. A Taxi Commission was formed and taxi driver Paul Gillespie was made Commission President. Paul had been a student in Michigan when the 1973 oil embargo hit and the nation awakened to the need for fuel efficient cars. Paul looked at the 1997 taxi fleet consisting primarily of Ford Crown Victoria’s that could get 15 mpg in theory and 10 mpg in typically SF taxi use. Early purchases were made of taxis that ran on CNG, not gasoline. Airport taxi fleets were early adopters of CNG. Taxis running on CNG get first priority in passenger pick-ups, a policy that gives taxi owners a major incentive to use the clean vehicles. They also receive a tax credit of $6,000 per CNG vehicle. Gavin Newsom went on to being elected mayor of San Francisco, whose citizens widely support climate solutions. Like any political leader, in 2008 he took criticism from many quarters for targeting a 20 percent greenhouse gas in the taxi fleet over the 1990 level. He was all smiles when it was announced that a 49 percent reduction in GHG has now been achieved. From clean cars to electric transit to solar rooftops, San Francisco is now recognized as one of the greenest cities in the world. Gavin Newsom was recently elected Lt. Governor of California. By working closely with San Francisco Yellow Cabs and Luxor to meet their fuel economy and emission objectives, Ford has been able to grow its business even as its cash cow Crown Vic fades in popularity. Sixty-seven percent of the SF Taxi fleet is Ford. Escape Hybrids are seen everywhere shuttling business people, tourists, and car-free city dwellers. With this being the last year for the Escape Hybrid, Ford is well positioned with the C-MAX Hybrid – a crossover SUV expected to deliver over 40 mpg. Even better fuel economy will come with the midsized Ford Fusion Hybrid with an expected fuel economy of 46 mpg. The C-MAX Hybrid and Fusion Hybrid put pressure on Toyota whose Prius and Camry Hybrid are also widely used by SF Taxi owners. Globally, over 12 million vehicles can run on natural gas. The numbers grow as oil prices fluxuate around $100 per barrel and natural gas at only $2.50 MMBtu. The Ford CNG-powered Transit Connect Taxis will hit the streets of San Francisco. CNG-powered Transit Connect Taxis are being used in Los Angeles, Chicago, Las Vegas and St. Louis. The standard Ford Transit Connect features a 2.0-liter I-4 engine that gets 22 mpg in the city and 27 mpg on the highway. The estimated fuel economy of a CNG-powered Transit Connect Taxi is the same as the standard gasoline version. However, operating costs are lower because the cost of a gasoline gallon equivalent of CNG is roughly half the cost of a gallon of regular gasoline. Will Taxi Fleets Use Electric Cars? 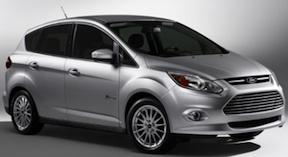 Since a typical taxi consumes over $20,000 of gasoline per year, I asked Ford’s Fleet Marketing Manager, Gerald Koss, about the potential for Ford’s exciting new plug-in hybrid offerings the C-MAX Energi and the Fusion Energi. Both cars have the ideal five-seat, larger cargo space needed in taxis. Both should operate about 30 miles in electric mode before efficient gasoline engines engage to give them hybrid fuel efficiency. Koss sees the hybrid versions strongly outselling plug-in hybrids with taxi fleets, although PEV pilots could occur in several cities. In a typical 300-mile taxi day, the electric might only help with 10 percent of the driving, require a new charging infrastructure, and added costs. Koss expects the C-MAX Hybrid to do quite well with taxi fleets. With a 300-mile range at a pricy $79,400, the new Tesla Model-S could be an interesting limosine offering in places like New York, San Francisco, and Hollywood where Priuses are often requested over Lincoln Towncars by environmentally conscious people and corporations. Even fast charging is too slow for a taxi operation. A fully-charged battery is needed in five minutes for the electric car to have potential in taxi fleets. Better Place has installed battery switch stations for taxi, fleet, and consumer use in Japan, China, Israel and other countries where electric car lithium battery packs can be robotically replaced in less than five minutes. Better Place, with support from the U.S. Department of Transportation via the Metropolitan Transportation Commission, announced a commitment to bring a switchable battery, electric taxi program to the Bay Area in partnership with the cities of San Francisco and San Jose to further cement the region’s position as the “EV Capital of the U.S.” By 2014, the program envisions deployment of four battery switch stations in the San Francisco to San Jose corridor that supports a fleet of zero-emission, switchable taxis. Taxi fleets can move faster than most consumers in adopting alternative fuels and electric vehicles because they can support a fleet with centralized fueling, battery switching, and maintenance teams. Look for a number of exciting pilot fleet tests. Next time you hail a taxi in a major U.S. city, it is more likely to at least be a hybrid-electric because these cars pay for themselves in months in reduced gasoline use. By the way – I am targeting Orange County, Riverside County, and San Diego County for starters.